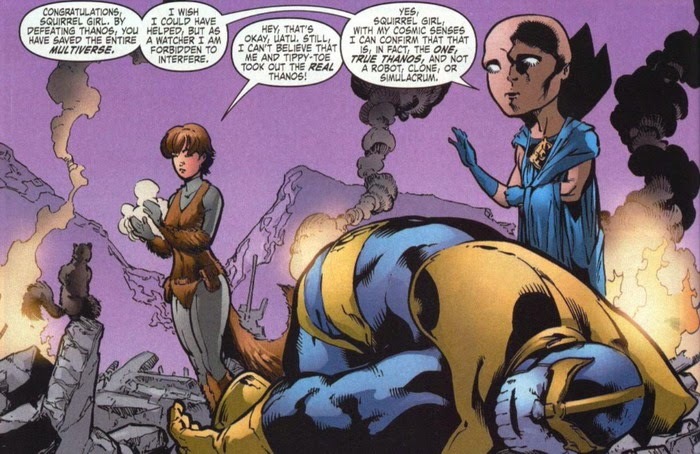 Hence, Squirrel Girl is essentially unbeatable, but that fact is more played for comedic-relief than anything else. This made me wonder how a Squirrel Girl comic would work. I mean, her defeating Doctor Doom and such is actual in-canon Marvel history, but such feats were normally shown as being funny. So, I imagined a "Squirrel Girl" comic that was super-serious could fail miserably. 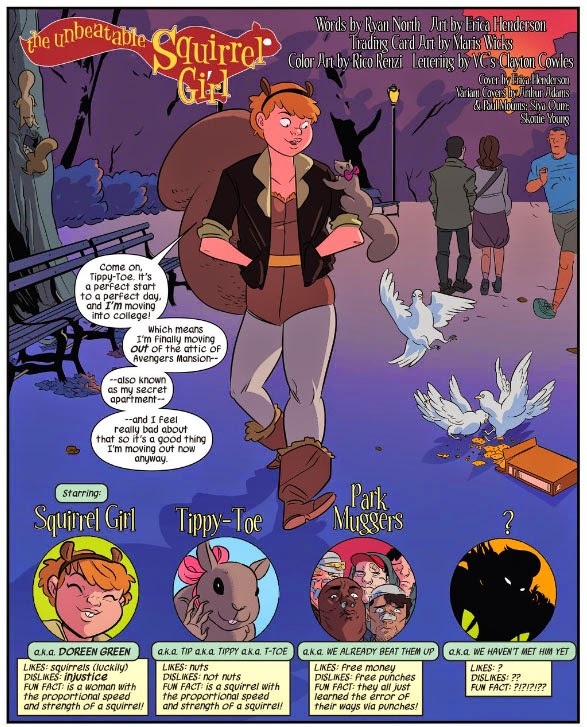 Thankfully, everyone else involved with making the comic realized this too and "Squirrel Girl" is a fun and funny delight..
"The Unbeatable Squirrel Girl" #1 Rocks! Writer Ryan North has written a variety of humorous comics and artist Erica Henderson brings a peppy style to a comic that by all logic should be at best weird and at worst terrible, but is in fact incredibly good fun...and weird, but in a cool way. We open with Doreen Green going off to college and nary a mention of any past experiences her character has had for those worried about continuity leading to confusion. Her faithful side-kick Tippy Toe is there too, arguing about the point of going to college while Doreen struggles to hide her squirrel-gifts from others. We meet her new roommate, and watch her defeat Kraven the Hunter in her own unique way--continuing the trend of her being impossible to defeat. It is a relatively mellow issue, especially considering how the next will apparently take Squirrel Girl to the moon for a fight with Galactus! It's a comic crafted with a great deal of care, from the amazing art by Henderson to the pitch-perfect writing by North. 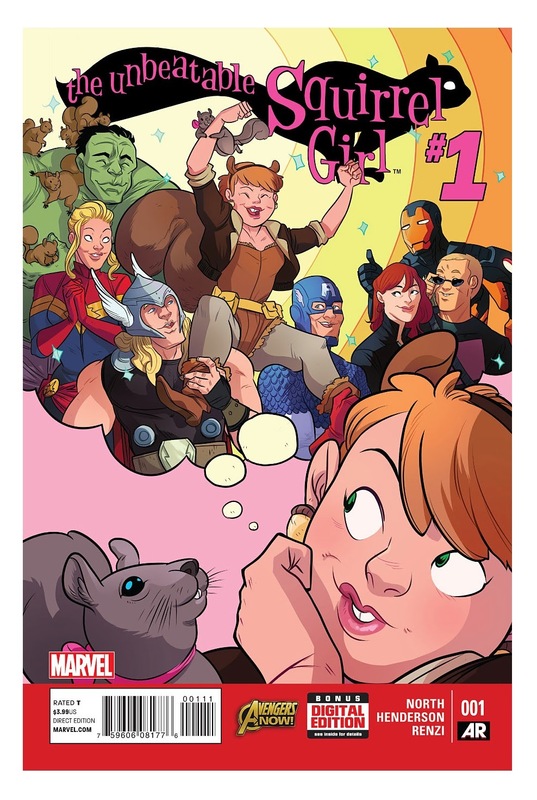 I'm overjoyed to say that the art is bright and energetic, and the plot gives us a Squirrel Girl who is smart, self-assured, and otherwise awesome. This comic was just wonderful, so it got me to thinking...why don't/doesn't (depending on if you think of Marvel as a singular entity of multiple folk) Marvel do more comics like this? so how will it be that new or different? Marvel has been doing more offbeat comics recently, but still seems to be putting plenty of focus on the usual event-madness in their other titles. We've got stellar unique books like "Hawkeye" (soon to re-launch with a new creative team), "Moon Knight", and "Ms. Marvel" (See End-Note 1), all critical darlings and commercial successes, but then yet another mega cross-over happens every month or so. Perhaps as I grow older, crankier, and try to be more responsible with money I've grown tired of these expensive mega-events that change everything (at least until the next event) so I appreciate stand-alone books such as the upcoming "Howard the Duck" more-so than all this "Secret Wars" business--even if I think the idea of it sounds fun. Then of course, there is the problem of how if a book isn't a huge galaxy-changing comic it is somehow less important than the latest "Avengers" or "X-Men" comic that kills off some hero who will return in a few months. Just because a book is in continuity but not "important" it is absurd to act like it is less worth reading. One reason I'm doing more independent books or enjoying comics from the Big Two that are out of continuity (You rock, "Injustice"!") is if a book lacks the pressure of "mattering" in some big comic-Universe it can really cut loose more--like our titular Squirrel Girl's book does. The biggest continuity-aspect of this book is one thing that gets mentioned. Namely, how "Squirrel Girl" was living at the "Avengers Mansion" previously. Apparently in some older Avenger-comics she was a nanny to Luke Cage and Jessica Jones' baby. It is true that not every "different" comic Marvel does is a surefire hit--everyone still is sad about "She-Hulk" ending--but if a big thing the comic-book industry wants is more readers, doing books such as "Squirrel Girl" might help. A fun comic unburdened by a ton of continuity about a strong female character--that also happens to be a hoot to read. Their titles don't have to all be funny in the manner "Squirrel Girl" is, but just doing more experimental stuff other than potentially more Avenger comics would be great (See End-Note 2). End-Note 1: "Ms. Marvel" admittedly came out of "Infinity" but you don't have to know much about that to enjoy it. 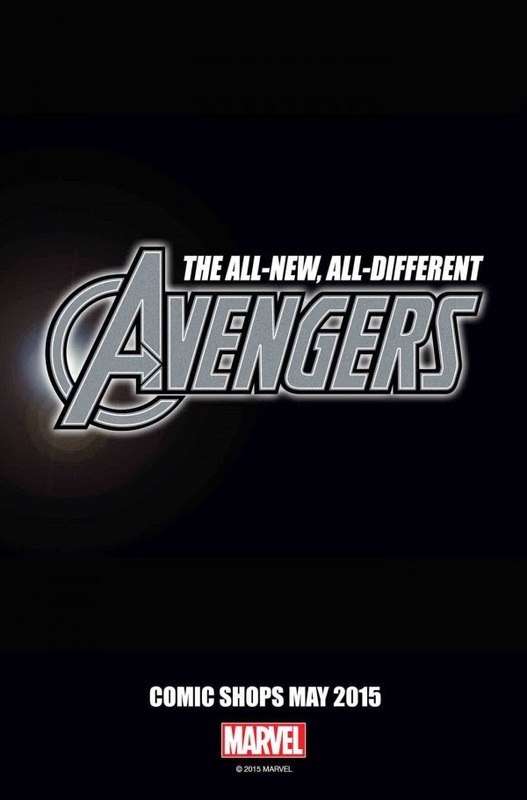 End-Note 2: I have to confess I do continue to enjoy "Captain America and the Mighty Avengers" which grew out of the most-recent "Mighty Avengers" even if I'm sick of most other Avengers titles.